Just when we think Disney has thought of it all – they go and surprise us with some new, ingenious plan! Disney is well aware that as the crowds increase with new attractions, lands, and resorts on the horizon, they must prepare for the getting guests to and from the parks. So, here we introduce another form of Disney transportation – the Disney Skyliner! While we wait for the Disney Skyliner to officially take to the sky, we anticipate transportation that is convenient, all while offering picturesque views of the Walt Disney World Resort. Let’s chat about what we know so far about the Disney Skyliner! Disney’s transportation has always been a favorite of ours. Not only is it super convenient, but most forms of Disney transportation are free! Currently, Disney offers bus, boat, Monorail, and the newer Minnie Van Service (which does have a fee). Well, now we are thrilled with the great anticipation of the Disney Skyliner – a point-to-point gondola transportation system. 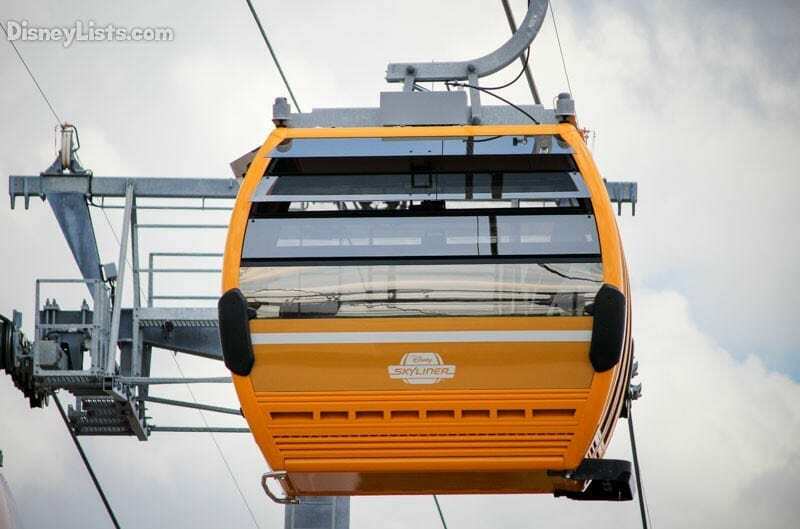 The gondola system allows guests to board an enclosed cabin where they will glide through the sky on a steel cable from one station to another. You may remember the days of the “Skyway” at Magic Kingdom? While the Skyway transferred guests across Magic Kingdom until it closed in 1999, the Skyliner is the same idea – just in a much more modern and expansive way! The rumors about a gondola-style travel system coming to Walt Disney World first began in February 2017 when Disney filed a building permit for “V”- shaped structures that were rumored to look like gondola stations. 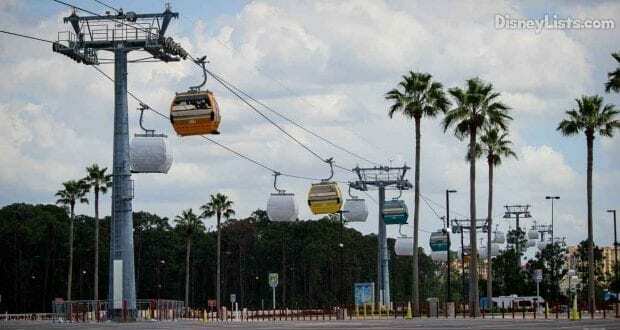 When the D23 Expo rolled around in July 2017, Disney Parks Chairman, Bob Chapek confirmed the Walt Disney World Resort was in fact getting a gondola form of transportation, to be called the Disney Skyliner. No time was wasted after that, as construction began in late 2017. The anticipation and excitement continue to grow as we regularly check out the incredible progress being made! The Disney Skyliner is rather impressive in the three-mile distance it will travel. It will connect Hollywood Studios and Epcot to Disney’s Caribbean Beach Resort, Pop Century Resort, and Art of Animation Resort. And while this may not be beneficial just yet – it will also connect with the new Disney Riviera Resort located between Hollywood Studios and Epcot. Epcot’s International Gateway Station: If you’re used to easily getting into Epcot via the side entrance (International Gateway), well, the crowd traffic will be picking up at this location once the Skyliner opens! The International Gateway Station is said to be inspired by Epcot’s European Pavilions close by, to include metal and glass canopies, hand-painted murals, and steel structures that are themed from the early 19th century Art Nouveau style. We are looking forward to seeing great views of the Epcot World Showcase! Turn Station: While this isn’t a station for loading or unloading guests, it will be a neat experience to see some of the mechanics behind the Skyliner. Here the cabins will slow down for a turn along Buena Vista Drive. New Rivera Resort Station: A new resort is on its way into Disney World called Disney’s Rivera Resort! As mentioned above, Rivera is located between Hollywood Studios and Epcot. Set to open in Fall 2019, the Disney Skyliner will make a stop at this resort. Details on the station theming have yet to be released. Caribbean Beach Resort Station: This station seems like it will be the largest and the primary hub of the Skyliner with an open-air village marketplace theme to match the Caribbean in architecture and color scheme. This will be a transfer station which means guests can easily load and unload here to set off for a different direction – to the Hollywood Studios station perhaps! Hollywood Studios Station: We’re so excited to check out an aerial view of Twilight Zone Tower of Terror! The Hollywood Studios Station will fit in well with the park’s main entrance and bus loading area. Pop Century Resort and Art of Animation Resort Station: This will be a shared station between the two beloved Value Resorts. Both resort themes will be pulled into this colorful station! Enjoy views of Hourglass Lake that separates Pop Century and Art of Animation. The Skyliner cabins will feature all our favorite Disney characters designed on the outside of the cabin. Characters Disney has mentioned or shown in art renderings include the “Fab Five” characters, Beast and Belle, and Hitchhiking Ghosts. The cabins will seat 8 guests per cabins. While this doesn’t seem like many people, it is still suspected this form of gondola system can transport 3,000+ people in one hour! It has been confirmed that the Skyliner will not have air-conditioning. With the Florida heat, this sounds like it will be painfully uncomfortable but are sure Disney will have proper ventilation that will help the breeze benefit the air in the cabin! We also know the cabins will have an audio system allowing for announcements and safety information, much like the Monorail. Disney has announced that the Skyliner will open in fall 2019. We’ll be sure to bring you Skyliner news as Disney releases it. In the meantime, we’ll just have to keep daydreaming about the beautiful views we can expect to see from our gliding cabin!